There may come a time when you have to bid a fond farewell to an old computer. Perhaps it just doesn’t have enough processing power or drive space to cut it as a message center or a backup server. Or maybe your small living area can’t hold yet another machine. Whether you want to sell it, donate it, or simply recycle it, you should take steps to protect yourself and the environment. No matter what you plan to do, start by gathering everything that came with your Mac, including system installation discs, product manuals, power cables, and other included gear. Then on your computer, select About This Mac from the Apple menu and click on the More Info button to launch System Profiler. Write down your machine’s model, processor, memory, optical-drive, and networking information. Also note which version of Mac OS you have installed. Then it’s time to polish up your Mac. This means wiping down the computer itself, as well as deleting personal information from the hard drive. Clean Your Machine Before you take pictures to post online, remove any stickers and give the case (and display, if applicable) a good going over with a nonabrasive cleaner, such as Meridrew Enterprises’ iKlear Apple Polish ($25). Compressed air, available at any office-supply store, will get the dust out of hard-to-reach places like vents and keyboards. Deal with Software If you use programs that are registered with your machine, make sure you deauthorize them. This includes apps such as iTunes and the programs in Adobe Creative Suite 2. In iTunes, go to Store: Deauthorize Computer. For Adobe CS2 apps, go to Help: Transfer Activation to install the software on your new machine. It’s also important to remove third-party software, such as Microsoft Word. Copyright holders will go after sellers on eBay who attempt to vend systems with installed software. If you don’t remove those programs, your advertisement may be removed. When the Disk Utility window opens, select the hard drive in the pane on the left; then click on the Erase tab. Select Mac OS X Extended (Journaled) from the pull-down menu; then click on the Security Options button and make sure Zero Out Data is selected. This will overwrite your drive with zeros. (Newer versions of Disk Utility also include 7-Pass Erase and 35-Pass Erase options—overkill for those of us who don’t keep state secrets on our machines.) When the process finishes, close Disk Utility and follow the installer prompts to reinstall OS X. Once your Mac is clean and ready to go, you have a number of disposal options. Sell It You’re probably already aware of some of the most popular places to sell used computers, such as eBay and Craigslist. 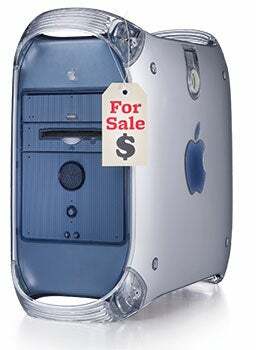 But there are also many Mac-only classified-ad resources online, such as MacSwap and SecondhandMac. No matter where you sell your machine, there are a few precautions to take. First, be as explicit as possible in your listing, to avoid returns—for instance, if your PowerBook has dead pixels, disclose that fact. And protect yourself from online scam artists by requiring that buyers have PayPal accounts. Even if the purchaser ultimately uses another payment method, this confirms that he or she actually has a bank account. Donate It OK, so that Mac you dropped a cool grand on a few years ago is now worth less than an iPod shuffle. If that’s the case, consider donating your machine to charity. Most experts suggest donating to a refurbisher rather than trying to give an old Mac directly to a school or a charity, which may not be set up to receive it. TechSoup.org maintains a database of organizations that will take your donated computer. It’s even searchable by zip code to help you find an organization in your area. Recycle It If your old machine is broken or dead, it may be ready for the electronic bone yard. But don’t just pitch it in the trash. Throwing away a computer or monitor is against the law in many states. And even if it’s not illegal where you live, it’s the wrong thing to do. CRT monitors are loaded with heavy metals like lead and mercury, and the metals and plastics in a logic board aren’t exactly eco-friendly, either. This so-called e-waste accounts for approximately 20 to 50 million tons of refuse annually. According to the EPA, 4.6 million tons of e-waste wound up in U.S. landfills in 2000, and studies estimate that discarded electronics make up about 40 percent of the heavy metals found in landfills. If you’re buying a new Mac, Apple will recycle your old machine for you—even if it’s a PC. If you’re buying online from the Apple Store, select the Apple Recycling Program option during the verification process. If you’re at an Apple retail store, inform the clerk that you want to recycle your old computer. Even if you aren’t buying a new computer, you can still find a recycler in your area by checking the state-by-state map at the Computer Take Back Campaign Web site. Find Out What Your Mac Is Worth: The PC Selling Zone from eBay and Dealtree.com is a great place to estimate your computer’s value. Erase Your Data: Choose the Zero Out Data option when removing personal information from your machine.